Shouting and laughing freely, something they haven’t done for a while… in far too long. The team of the West Island Women’s Shelter would like to thank you, from the bottom of our hearts, for your participation in the rejuvenation of the backyard. 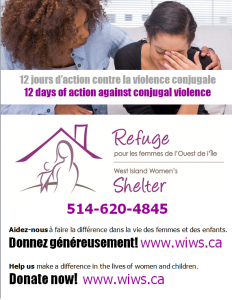 Due to your generosity, mothers, children and adolescents will have the opportunity to enjoy a modern and safe space. This will bring them together, offering them the time and the space to bond, and to have privileged moments with each other. Nothing to think of, but creating new and happy memories. Installation of a security system for the fence that accesses the backyard.